What kind of vacuum cleaner does a Household need? The perfect answer has finally come out by the Xiaomi. A new Robot vacuum has announced by the Chinese Tech Giant Xiaomi, it is an Ecosystem product developed by a company called Rockrobo. Xiaomi seems to be unstoppable with the launch of bunch of lifestyle products like Mi ecosystem, Smart Filter Kettle. As per the company, the Mi Robot Vacuum is highly intelligent with an inbuilt Laser Distance Sensor (LDS) technology. It can able to scan its surroundings 360 degrees 1800 times per second. Xiaomi has also installed SLAM (Simultaneous Localisation and Mapping Algorithm) which enables the Robot to best housing path and to map out the whole house and calculate. It has implemented a total of 12 sensors in the machine to ensure a high level of efficiency and intelligence. 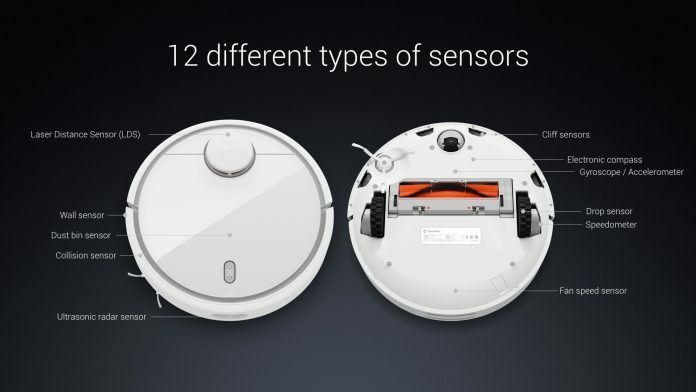 There are three dedicated processors in the Xiaomi Mi Robot Vacuum for real-time mapping. It also sports a powerful Nidec brushless DC motor up to 1800Pa air pressure, ensuring not only for better cleaning but also delivers ultra-quiet airflow. The whole Robot Vacuum is backed by a 5200mAh battery which Xiaomi offers claims up to 2.5 hours of cleaning. Once it is fully charged, it starts its operation where it left earlier. The main brush of Robot vacuum can be adjusted at different heights for thorough dirt picking on uneven surfaces. Xiaomi also claims that the device has effective side brushing to clean near walls without any trouble. Like other Mi Ecosystem product, Mi Robot Vacuum is controlled with smartphones using “Mi Home app”. This app helps to set regular cleaning schedules and helps to switch on/off the device. Mi Robot Vacuum Cleaner will be launched in China on 6th September, for RMD 1699 which is approximately Rs. 17,100 on Mi.com and Mi Home stores in China.